From the kitchen of One Perfect Bite...Every year, around this time, I make peppermint ice cream to use in a refrigerator cake I serve during the Christmas holidays. I also use it to make ice cream sandwiches that I keep on hand for unexpected guests. This is a really lovely ice cream and buying chocolate wafer cookies makes the ice cream sandwiches really easy to put together. Once the ice cream has firmed enough, I assemble the sandwiches and freeze them on cookie sheets, in a single layer, for a couple of hours. I then transfer them to a freezer bag for longer term storage. I remove them from the freezer about 15 minutes before I plan to serve them. Children love to help make these. They also do a pretty good job of making them disappear. This is the recipe I use for the peppermint ice cream. Crush the peppermint candy to a powder if you prefer an ice cream that is perfectly smooth. If you like bits of peppermint in your ice cream coarsely chop the candy, but make sure the pieces are small enough not to harm your ice cream maker.You might also want to add a drop or two of red food coloring for better color. 1) Beat eggs and sugar together in a small bowl. 2) Place milk in a saucepan and heat until it starts to bubble. Whisk hot milk into egg mixture. Pour mixture back into saucepan, stirring constantly, until mixture thickens and coats a spoon. Chill for several hours. 3) Stir in cream, vanilla and peppermint extract. Pour into an ice cream maker. Mix according to manufacturer's instructions, adding crushed peppermint for last 5 minutes of churning. Transfer to a freezer container. Yield: 1-1/2 quarts. Happy Saturday sweetie. I have to tell you I am going to try this peppermint recipe. We have two birthdays coming up in December and who doesn't like ice cream sandwiches. I am wondering if I could use a biscuit cutter to shape the ice cream centers. Thanks for sharing as always sweetie. I love to come and visit. Such a great pink color and I love those ice cream sandwiches. Yum! My all time favorite flavor! The ice cream sandwiches look delicious! Yum! peppermint ice cream is one of my favorties - especially when its pink! It's way too cold around here for ice cream already though. Bummer. These look delicious! I'll have to try this with my Bailey. Thanks for sharing the recipe darling. You never disappoint..
that looks wonderful! I eat ice cream, even the frozen tundra, all winter long. it's never too cold for me!! This looks so refreshing, Mary, and I like that color, especially for the holidays! I have got to go run look at the brussel sprouts below. They are a favorite of mine. Excellent recipe! My son and I plan to cook, bake, and spend lots of time in the kitchen over winter break. We will be here often. Peppermint ice cream is a holiday favorite in my house. And what a great idea to make sandwiches out of it. I'm all for make ahead desserts during this busy time of year. Your ice cream looks delicious. I can almost...almost taste it. Such a pretty color! I don't eat much ice cream but I always buy a small container of peppermint for the holidays! What fun and tasty pinks today!Hope you are having a wonderful Thanksgiving weekend. Thank you for stopping by and also for your lovely comments! Means alot to me. Your recipe with the bacon sounds real good. I am going to try that one soon. Oh my... That pink ice cream is right up my alley! And nestled between two chocolate cookies is even better. Thank you so much for popping by and wishing me well with the new job. I hope your Pink Saturday is perfectly pink in every way. That looks so yummy! Happy Pink Saturday! Oh, oh, oh, I LOVE peppermint!!! Another receipe I'm going to try!! Oh, Mary ~ such a luscious dessert! It looks especially good to me after all the heaviness of Thanksgiving food! My Grandma used to make peppermint ice cream and then put it in pointed cones and make clowns out of them....it was wonderful as a kid. Can you pass me one of those yummy ice cream sandwiches?...Pretty please?! This looks so beautiful and I think it is good when you are ill likes me at this moment . I LOVE peppermint ice cream! It's one of the things I look forward to this time of your. Your photos are wonderful - it all looks delicious. I have to tell you I always enjoy stopping by your blog - there's always something wonderful. Happy Pink Saturday! I love ice cream any time, any place. Thanks, Mary. Oh yum! It's always time for ice cream and those recipes look fantastic!! This looks absolutely scrumptious!! It doesn't matter what time of year...we are always happy to enjoy some delicious ice cream. Love the peppermint ice cream..it's a wonderful shade of pink...and down below..oooooo,those brussel sprouts. They will be on my Christmas table..and I can't wait to taste them. Happy Pinks Mary..and have a blessed weekend. Love that yummy pink ice cream~I haven't used my ice cream maker for a long time, think I will get it out and try this one~thanks for sharing all your yummy recipes. Oh, Mary...my grands are going to love you for giving me this delicious sounding recipe. I will make some for our Christmas Eve gathering. The whole bunch will love these!! oh boy, your peppermint ice cream looks so yummy! These pink ice cream sandwiches look delicious. I love this blog, you always have some special treats for us. You have my vote for the most scrumptious pink treat this week!!! MMM...it looks so good! I must try these! Thanks for posting. It is Never too cold for ice cream! 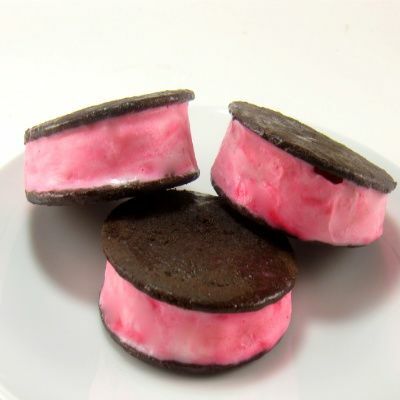 I love these pink minty sammies, what a great idea to hsve them on hand during the holidays. Yummy...I'd like a bite please. Oh my goodness this looks delightful! Any recipes flour and sugar free? Ciao Mary, I seem to understand that the ice-cream is pink because of pink Saturday, but I still cannot make the connection between the colour and peppermint...are peppermint flavoured things pink where you live? Oh my gosh, this looks so good. I always loved ice cream sandwiches and these are wonderful! Happy Pink Saturday! Happy pink saturday Mary - have a fabulous week. Alessandra, you asked about pink and its association with mint. Candy canes are pink as is peppermint candy sold here at this time of year. 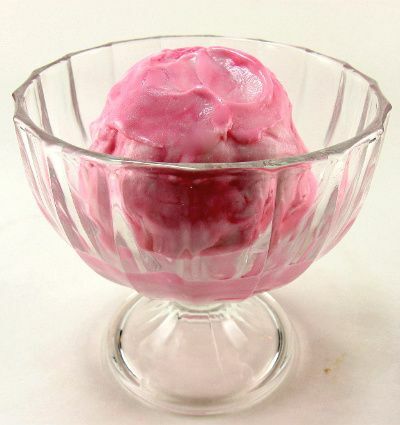 Pink peppermint ice cream is a very seasonal recipe in the US. I have another recipe on my blog for ice cream made from fresh mint. That might be the recipe you would prefer to use. What fun! My dh would love this icecream - he is a big peppermint fan. As for me, I'd prefer the crunchy ice cream cake. :-) You always amaze me with your pink posts for Pink Saturday. You are not only a wonderful cook, but a great photographer, as well. Everything always looks absolutely professional. My dh did all the cooking at our house this Thanksgiving - he wanted to do it. But everything was yummy. Hope yours was fabulous. They are so pretty. I believe I could assist in making them disappear, too. YUM, YUM, YUMMY...how I wish we had the ability to reach through our screens and grab one of your SWEET treats! Mary, those look absolutely wonderful! I love ice cream any time of year and this is a recipe I'm definitely going to have to try! Pair that with chocolate and what could be better! Thank you for visiting my blog today and leaving your kind comments. I really appreciate your visit! Thank you for the explanation Mary, I didn't know. Loved, loved, loved this. I ordered a new ice cream maker and it should be here soon. Now I have just the recipe to break it in. Only you would have thought of pink ice cream for us today on Pink Saturday. I really enjoyed it. What a great recipe. I will be making this one. Great photos. Thanks so much for this post. Oh that sounds so refreshingly lovely, and I love the sandwich twist! I imagine this is a sweet and refreshing treat all at once! They sure look yummy and pretty in pink too! Happy Pink Saturday and thanks for visiting! Those are beautiful, Mary; who wouldn't love to be handed one of these tasty treats! love the color and they look delish! I have to chuckle at Dave's (AYOTG) comment about waiting for summer. We eat ice cream year round here. This looks soooo very very good! Mary, wow that sandwich looks yummy, and who doesn't love ice cream! Double yum! Oh YUM! These look so good, I think I need some peppermint ice cream right now! That's just mean!! That looks so yummy...and can only imagine the wonderful flavor! Any houses next door for sale????? OMG, my kind of ice cream you got here! Thank you for sharing this fantastic recipe. Sorry I am late for Pink Saturday, we have been out of town all week. Love the Peppermint Ice Cream sandwiches....wow do they ever look good.